Correct. I though it didn't have any oscillation with the Alakline but did with the PSU & NiMh, but that's because my Alakline was too high a voltage (1.5V) and the regulator simply wasn't on at all. Repeating test with 1.3V alkaline shows the same oscillation. So yes, it's the chip going into a sleep type mode and the caps charging. The problem with both a resistor and that supply is impedance, batteries has fairly low impedance at high frequency, this means many devices only have a small input capacitor, they assume the battery handles it. This is difficult to simulate with a power supply, especially with long test leads. Are you sure they're the same? Frank posted this screenshot waayyyy back on page 4, and it's exactly what would be expected from a charge/drain cycle with hysteresis (a near-perfect sawtooth shape). The image you posted a couple pages back is qualitatively very different. This one is much more distorted. That does not look like cyclic periods of charging and draining, it is much more distorted than that. What is the source of this image? What conditions was it measured under? Which one are you getting from your batteries? EDIT: I saw the graphs you posted on the last page, and they're the same type as Frank's, and different from the blue one. OK, I got my 4 x AA Batteriser sleeves last week and here is my first test. Here are the screen captures from the official Maynuo battery testing software. 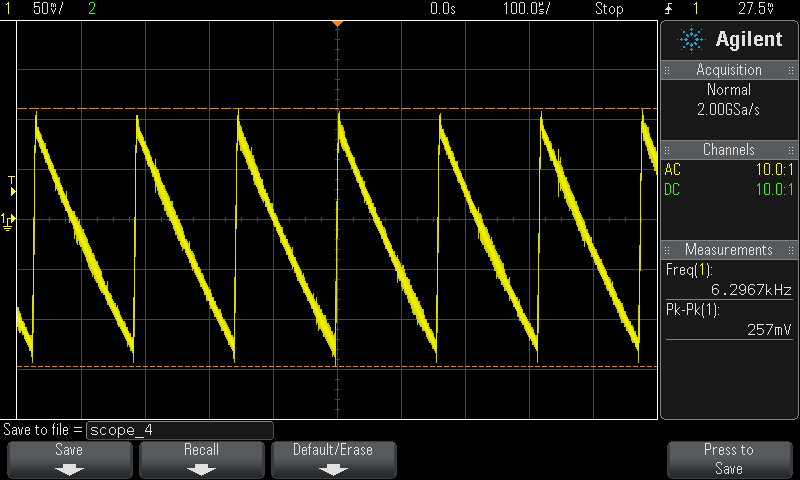 I am surprised how fast the voltage curve drops at about 1.2V batteriser output. Until the total collapse, the batteriser output voltage is higher and flatter than the battery only. But under no circumstances will I get more energy out of the battery ! The current consumption is a little over 1 A at startup and then it goes down to 700 mA, when the motor has reached maximum speed. On 4 new Duracell AA cells this motor was running for 3 hours 15 min. On 4 new Duracell AA cells and 4 pieces Batteriser the motor ran for exact 1 hour. The voltage graph is taken with the batteriser installed at the motor. Run time is much less with the Batteriser! Out of curiosity, has a batteroo sleeve ever been sent to anyone who can decap the boost converter IC? I did see it being mentioned in the original thread, but I don't know if that ever happened. Can anyone with a Batteriser please use multimeter on the diode test range to see what the Batteriser looks like with a reverse voltage and no battery (or a completely flat battery)? Does it look like a diode or an open circuit? If it looks like a diode, what is the voltage drop with the multimeter? When a Batteriser shuts down with multiple batteries, it gets a reverse voltage. Looks like a Diode, 0,438V Drop with no battery attached. What this means is that in a multi battery device, when the first Batteroo shuts down, the current goes through this diode. The device could still keep running as if it uses 4 batteries, the other Batteroos are still providing 4.5v and this diode completes the circuit. If the current was 1A, the voltage drop at 1A may be 0.6V and so there is a 0.6W dissapation in the chip. How hot does the chip get with a 0.6W dissapation? It is not that hard to measure as diodes have a reliable -2.1 to -2.2mV per degree C temperature coefficient. So if measure the ambient temperature and do a current versus voltage drop curve, you can convert this to a current versus die temperature curve. If the chip gets to 150 deg C, it is getting close to failure. Usually the chip fuses - it turns into a lump of low resistance metal. It may be that this factor decides the real maximum current the Batteroo can supply in a multi-battery device. The other thing that this can mean is that if you put a new battery with a Batteroo in a multi battery device, and put it in a multi battery device as the last battery, and the device was switched on as you are inserting the batteries, it may be possible to cause the Batteroo to latch up - which could cause it to try and pull the battery down to perhaps 1.2V. This would cause the Batteroo chip to overheat, and fail as above. This is a possibility, but the chip could also be a latch-up resistant design which would prevent this condition. So here are two possible Batteriser failure modes that do not involve the clip shorting to the battery cell case. Both could end up with a Batteroo that shorts out the battery. Another failure mode is where the clip shorts to the battery holder itself when it is metal, like in a flashlight with a metal housing. This is only an issue with two or more batteries in series. Not as far as i know, but i can certainly send one of mine if someone can do it? Great thank you. Do you know when we can expect the results? Batteriser has gone from entertaining to embarrassing since they started shipping them. Still spouting the UL test as if it's the gold standard. I updated the first posting in this thread, summarizing some of the results we found so far. A "Power System Architect at Exar Corporation" wrote that? Does anybody have the email address of his boss? A "Power System Architect at Exar Corporation" wrote that? One that used to work with (and presumably was the boss of) none other than Mr Batteriser himself, Dr Bob. When Bob came knocking for a favor, I would have said my reputation wasn't worth it, friendship only goes so far. Perhaps we might now know who might have done the ASIC for them?, he looks like a great friend to turn to for hooking up such a custom job. Remember, a mouse was one of the products that Batteriser promoted at the time as it being useful in.